Disclaimer: The information on this page is intended for individuals who have been medically diagnosed with Achilles bursitis or Achilles tendonitis. If you suspect that you have either Achilles bursitis or Achilles tendonitis then it is important to visit a qualified medical professional in order to rule out any other possible causes prior to considering any advice or treatment option. Is Achilles pain stopping you from enjoying sports, exercise or keeping active in general? Achilles pain is normally a result of either Achilles bursitis or Achilles tendonitis. Normal treatment includes rest, pain killers, non-steroid anti-inflammatory medications, injections with steroids or even surgery can sometimes be recommended. Fortunately there is also now a natural alternative! 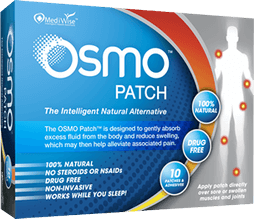 So if you are ready for a natural & effective approach to relieving inflammation and pain caused by Achilles pain then the OSMO Patch is the Answer! Also if you would like to learn more about the main causes of Achilles pain then simply Click on any of the links below.